This delightful pedal makes a great round trip to a picturesque old gold mining town. It is a return ride from Bright and is especially beautiful in autumn. The track wends its way for 5.5 km along Morses Creek, past the landing grounds for the hang gliders to an idyllic wander along the banks of the creek to Wandiligong. See https://www.visitbright.com.au/wandiligong/ for more information. There are cafes at the start of the trail. In Wandiligong there is an excellent café at the hedge maze. To find this, at the end of the ride turn right into Smithy Lane and then right and right again to follow White Star Rd. The hedge maze café is on your left. The ride is along a bike path. It is mainly flat. There is no public transport for bikes to Bright. So either bikes need to be transported by car, or you can catch the train to Wangaratta and one of the bike transport companies will take you to the start of the ride and pick you up at the end of the ride. Alternatively you can drive, or catch public transport to Bright and hire a bike there. Start the ride at the roundabout where Bakers Gully Rd, Ireland St and Railway Ave meet Cobden St. The path goes down the footpath alongside Cobden St.
After about 200 metres follow the road to the right as it turns into Coronation Ave.
At Park St continue to follow Coronation Ave as it turns left. From here, the bike path follows Coronation Ave, initially on the right hand side of the road and then crosses to the left hand side after about 200 metres. After about another 500 metres, the track will again cross to the right hand side of the road. Continue straight as Coronation Ave becomes Morses Creek Rd. The path will then cross a bridge over Morses Creek and turn right. Keep following the path up past the landing field for the hang gliders. After a further 300 metres, the path turns right and leaves Morses Creek Rd. It then meanders its way through bushland to Wandiligong, with the path now following Morses Creek itself. The path finishes at Smithy Lane. Turn left to head up to the community hall on Morses Creek Road. Turn right across the bridge over Morses Creek and along Centenial Avenue to go the hedge maze and the diggings. 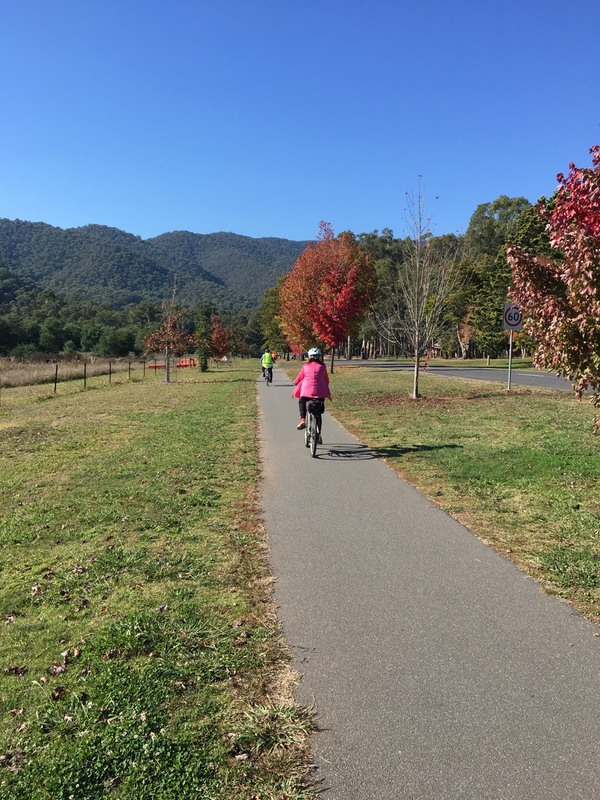 This ride can be done as part of Murray to Mountains Rail Trail. Alternatively, it is possible to ride up the Wandiligong valley for a further 5km. Turn right onto Smithy Lane to cross the creek then immediately left up Centenary Avenue, past the old gold diggings. About 1 kilometre up the road, Centenary Ave converges with Morses Creek Rd, which takes you past the Nightingale Apple orchards and chestnut plantations to near the end of the sealed road. Here one may feast on the fragrant mountain air and the pleasant views of an agricultural idyll, a place where time does not exist. There are no maps of this ride. Although it does not show the bike trail, you may find the following pdf map of Wandiligong to be useful.